I make small wonders for wise, creative, adventurous souls. 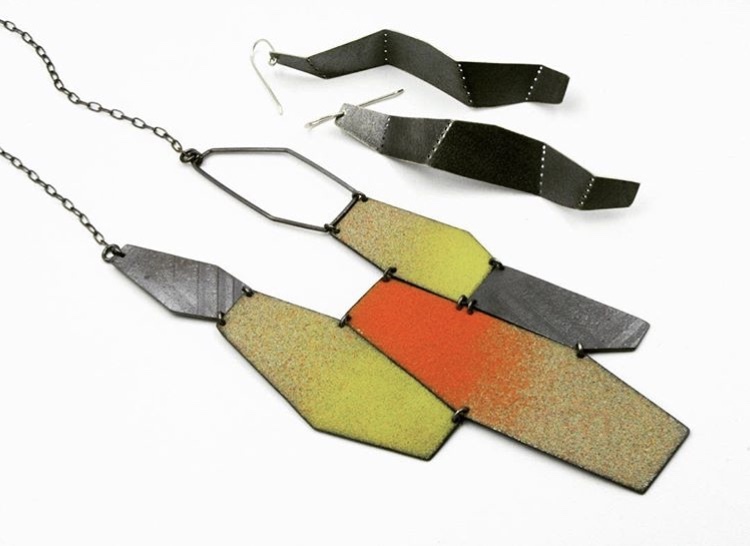 Feeling a late-in-life pull to create a personal body of work, I embraced jewelry design and metalsmithing as a sideline to my graphic design career. My work can be described as industrial, elegant and rustic. This marriage of contrasting qualities reflects the pursuit of harmony that persists inside all of us. My jewelry is my own answer to that struggle, which ultimately is not about seeking balance, but about embracing uncertainties and opposites. I like that jewelry requires a participant. It encourages me to create work that feels alive and relatable, with its small imperfections and uneven forms. And metal, while malleable, is also stubborn and challenging. This forces me to let go, embrace process and even relish mistakes. My painting and collage practice spurs jewelry ideas, and vice versa. And sometimes they even make their way into a piece of jewelry. For inspiration, I look to the synchronicity of forms, lines and textures that appear over and over across nature and through the built environment.